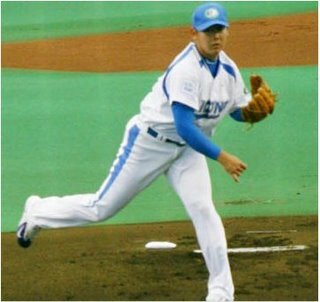 After ending the regular season with a very costly defeat, Matsuzaka looked to pick up the mantle of ace again and lead his Lions into battle. The task would be difficult as the opponent would be the Fukuoka SoftBank Hawks, led by former Triple Crown winner and WBC standout Nobuhiko Matsunaka, and likely 2006 Sawamura Award winner Kazumi Saito. Leadoff man, Munenori Kawasaki was also a member of the WBC champions. He walked an incredible 102 times to only 37 strikeouts. Matsunaka ranked 1st in average and on base percentage in the Pacific. He ranked 5th in slugging. 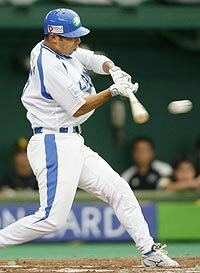 His 19 home runs were tied for 6th place with Seibu's left fielder and WBC teammate Kazuhiro Wada. Also, Matsunaka placed 6th in hits, 4th in doubles, and 7th in RBIs. Of course the walks ranked first ahead of 2nd place Wada, who had 78. Yup, he beat the number two guy by 24 walks. He leads in wins, innings, strikeouts, and ERA. He also leads in shutouts and is third in complete games. How would the matchup of aces turn out? Let's take a look. Things started well for Daisuke as he went 1-2-3 in the first inning. Actually, he hit the #2 man, centerfielder Naoyuki Omura, but he was erased on a double play. That hit batsman was another in a line of recent "dead balls" that Matsuzaka has produced, making me wonder about how tired he is getting after a long and grueling season. Saito matched him with a nice first inning, where he gave up a ground ball single, but erased the Lions on back to back swinging strikeouts to close the inning. Matsuzaka got himself into trouble in the second by issuing a leadoff double that was lined off the left field wall by Matsunaka. He then got ahead of the next batter, and hit him for his second hit batsman in as many innings. I began to wonder if this was going to unravel like his previous start to close the regular season. Fortunately, this is Japanese baseball and like clockwork the following batter, Hiroshi Shibahara, bunted to advance the runners. The bunt went directly back to Matsuzaka who fired to third and nailed the runner by plenty. The next two batters fanned on some wicked stuff. Saito went 1-2-3. Both pitchers worked out of trouble by retiring baserunners on double plays in the 4th inning. Matsuzaka got his revenge against Matsunaka by dropping the nasty slider on him for a strikeout to lead off that frame. It was apparent at this point that these teams were going to have to scratch something out in order to score and whoever blinked first would win. The fifth inning saw two fast outs for Matsuzaka before he lost the grip on what looked like a changeup to #8 man, Naoki Matoba. He had been ahead and dominating the batter, but something snapped and the control went south again. The ball crashed violently into Matoba's ribs and sent him to the ground writhing in pain. A short trip to the clubhouse got the batter back in shape and in the box. Matsuzaka got him to foul off the next pitch before bouncing one to the backstop. I though this was it for sure, but he induced a weak grounder to first to escape any further trouble. Saito again went 1-2-3 and no one had even come close to hitting a hard ball against him through 5. Pop up behind third, one out. #3 hitter Cabrera is dazzled by a nasty screw, changeup, and then high blazing heat. Strikeout looking. 2 down. Matsunaka with another hit. Single to right. Matsuzaka worked him with a nice inside fastball, a slider that missed, a nice slider for a strike, and then went to the well one too many times and hung a third slider. 2 down, man on first. Zuleta swings through 2 good ol' country fastballs high and out of the zone, and then weakly waves at either a slider or a splitter tailing away and dying low and outside. 3 outs. I began to take more detailed notes as this game progressed to see how the pitchers would operate in a tight game that was getting late early. 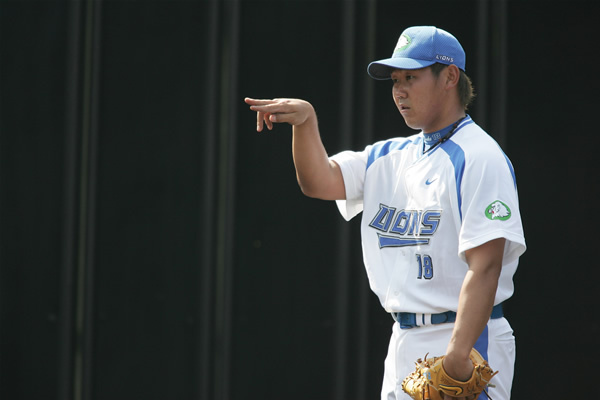 Matsuzaka was my main focus, so I will provide you with his details as I go. Saito dominated the 6th again 1-2-3. Matsuzaka starts off the 7th with a K on the #6 hitter. Got ahead 0-2 with offspeed stuff, then went heat for a couple of fouls before finishing him on a check swing with the slider. The #7 hitter ate the bench on 4 pitches. All heaters in the 93 MPH range. 2 outs. bunt single. Matsuzaka challeged hitter #9 with a combination of fastballs and offspeed stuff to get the count at 2-2. He left one up and we now have runners on 1st and 2nd, two outs. 99 pitches with 2 outs in the 7th. WBC shortstop and leadoff man Kawasaki was blown away by Daisuke on three straight pitches, but the third was oddly called a ball. Matsuzaka chafed at the call. He then threw a strike that was fouled off and then hit his fourth batter of the game. Bases loaded, two outs, manager comes to the mound to talk. Weak grounder to 1st unassisted ends the threat. 105 pitches through 7. Back to back hits to lead of the bottom of the 7th had Kazumi Saito in his first real trouble of the game. Hiroyuki Nakajima and Alex Cabrera hit line drives to put runners on 1st and 2nd with nobody out and WBC man Kazuhiro Wada at the plate. Saito mysteriously left the field with an uncomfortable look on his face and went directly into the clubhouse. I was stunned. Was this it for Saito? He had put himself in a real jam and was now off the field. 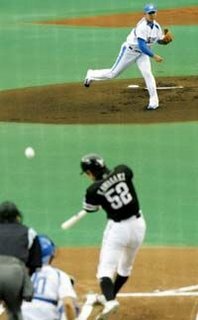 The long faces on the SoftBank bench were short lived as he reemerged from the dugout to take the mound. Perhaps he should have stayed where he was as Wada laced a pitch into left field for a run scoring double. 2nd and 3rd and nobody out. Saito didn't budge or blink. He promptly retired the next three batters on a grounder to second that didn't score the runner, and two swinging Ks. It was still a game, but Matsuzaka had the advantage now. Could he close the door? Daisuke starts things off in the 8th with his 8th strikeout. The Hawks' Cabrera waives at a slider in the dirt away. Matsuzaka goes 3-0 on slugger and former Triple Crown winner Matsunaka before getting a called strike one. He then challenges him with heat and produces two foul balls. The crowd rises to a crescendo.....changeup strike three swinging!!! #5 hitter, Zuleta, comes up and takes high heat for ball one. He swings through the exact same pitch for strike one. 93 MPH. Matsuzaka wastes a pitch on a dying quail inside. Same pitch on the outside corner is ball 3. Wicked slider drops in over the plate, 3-2. The crowd again bangs its drums and rises.....same wicked slider fouled off. Straight cheese over the lower half of the zone....94 MPH. 10 Ks for Matsuzaka through 8. Keeping the game close, Saito sucked it up and went 1-2-3 for the 5th and final time of the game. The one costly moment to Wada would spell the difference in his outing and in the complexion of this Best of Three series. It was up to the bottom of the SoftBank order to complete the mission and give them a chance to win. You know it didn't happen, don't you? You know if you've been paying attention to this blog. Kept the first batter off balance and got him to pop weakly behind short. One out. Fastball on the inside corner, strike one. Same pitch on the outside, strike two. Bounces the third pitch in front of the catcher (nice block), ball one. Way high and outside, ball two. 91 MPH fastball, swinging K. One out to a victory. Slider breaking away from the lefty, strike one. Wasted a poor pitch inside, ball one. Hanging slider that he got away with on a foul ball, strike two. Straight cheese, 94 MPH on the outside, swinging strike three. Game over. Seibu wins. 1-0 Lions on the night and in the series. In the postgame hero interview Wada gave credit to both starting pitchers and praised his teammate. Matsuzaka was happy to get the win and seemed very collected and poised during the interview. Fans waved "Sekai no Matsuzaka" signs behind him in the crowd, which means "The World's Matsuzaka". He laughed off the question about hitting 4 batters, but quickly regained his composure and said that it was no laughing matter. He apologized to the SoftBank players and asked for their forgiveness, with a friendly smile on his face. 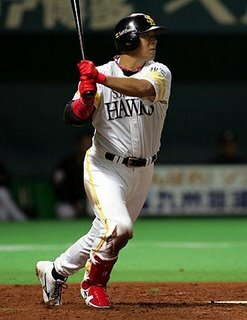 If his teammates can win another game, you'll see him again in the Pacific League Championship Series against the Nippon Ham Fighters. I'll keep you posted. Thanks for reading. Some teams still let pitcher running their pitch count this high? All Japanese teams let their pitchers throw like this. it's games like this that make me drool, but pitch counts like this that scare me. It seems that everyone assumes that it is a foregone conclusion that Matsuzaka will be posted. I have no doubt about his talent or that he would draw great interest from MLB teams, but how can you be sure that the Lions will post him? Anonymous, Mike Plugh actually had an article about this a couple of months ago. It seems likely that the team will post him. And hopefully the Yankees will get him. It looks like they could use some decent pitching. He will be posted because it will net Seibu $30 million, where they will lose him for nothing if they let him walk after 2007. They are in dire financial straits, so it makes sense. Also, the owner has already said he will likely be posted and he wouldn't say it if it weren't true. The fans are all amped about it now.